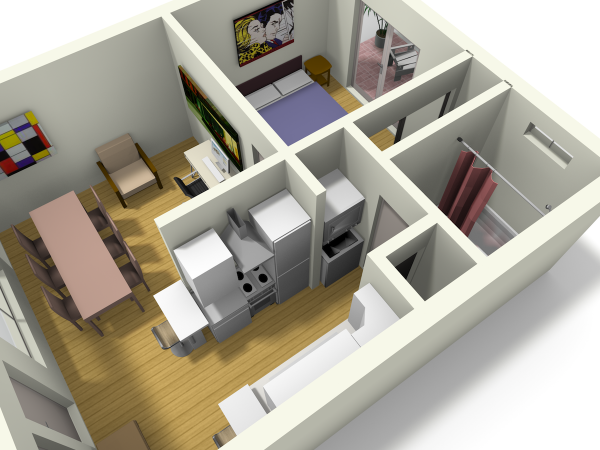 Think you can live in, work in, and share a small apartment? That’s what I do with my 500-square-foot apartment that I’m showing you today. I took my apartment’s dimensions, design and layout and did my best to match it. Then I made some slight improvements that I thought would make it better. Yes – we have two doors! The apartment we’re currently in is just like this and I’m not sure why. But one door is wider than the other. Why the Big Dining Table? We’ve got that oversized dining table so we can use it for work and then when my friends and family come over there’s plenty of space to eat together comfortably and share some laughs over a meal because that’s what life’s all about, right? The dimensions are approximately 25’x20′. My apartment doesn’t have this. We have shared outdoor space which is great. But something like this would be even better (so I added it to the design).. I also added the barstools at the end of the kitchen which is something we don’t have (yet). So what did you like best about this apartment? Could you, would you, or would you even want to live in a design like this? Would love to hear your thoughts on that..
And even better what sort of designs would you like to see me do next? LET ME KNOW in the comments (share links, etc. to if you have to). I’m going to shoot to create one of these a week. If you enjoyed this post “Like” and share using the buttons below then share your ideas on tiny/small house designs in the comments below. Thank you so much! Cool digs…..you don’t really have a giant painting of a laughing face in your living room though, do you? Lol. Talk to you/see you soon! Lol no sir I don’t but I sort of wish I did! Haha. Laughing faces are a favorite! See you in a few weeks Deek! I agree about too many walls, they definitely chop up a space and limit the possibilities. However, if that’s what you have to work with and it can’t be changed you just have to make the most of it. If a large dining table is only needed some of the time there are a lot of ingenious ones that can be made smaller or larger. There’s a variation on a picnic table where the table top flips up to become a bench back, wonder if something similar could be made to have a comfy sitting couch/bench that converts to a table. I like a lot of the kitchen carts that incorporate drop-leaf table space as well, some with bar stools. Not necessarily in place of the big table but maybe placed at the end of the kitchen counter. It could be moved around as needed, also makes a great buffet serving station at parties and extra work and storage space. Multifunctional furniture is essential in a small space. It’s a waste of space to dedicate large spaces to single use, especially if that use is only for a small amount of time. Unfortunately usually unavoidable if there’s special equipment involved, like kitchens and bathrooms. I would like an acces to the bathroom from the bedroom so I would move that washer/dryer to the kitchen closet and make an access door right there. Love the double sliding glass doors but for colder climates an insulated single door would be better. I deesigned my cabin to have work space and my loft serves as both bedroom and office. Since I do not have clients over there is no need for the big conference table and that would make a real nice guest bedroom/entertainment room. Fine… so you shift the washer/dryer combo to the kitchen cupboard, and put a door almost directly into the bathroom. By doing that you have LOST the original space to get access to the bathroom quickly, and in the process where do you store the stuff that was in the kitchen cupboard? Like brooms, dustpans, vacuum cleaner etc? If it was me… I’d push the washer/dryer over to the kitchen cupboard, extend the wall of the wardrobe to where the washer/dryer currently is and create a door at the other end of the wardrobe to gain access into the bathroom. But to do that you’d have to swap the toilet and bath around for space to walk in. And close off the door into the kitchen as it stands. And for what? To save yourself 15 seconds max getting to or from the bathroom? Wow, not what I’d call living frugally. But Alex, it is an interesting exercise in what you can do with a blank canvas so to speak. And for those who say get rid of the walls, uh uh, no way I would have an open space “showcasing” my bedroom. Hell would freeze over first. I’d move the bar stools to the other wall with a continuous desk from the front to the other side of the computer/work desk. Pus some comfortable chairs/couch where the stools were, move the door over some so the Chaise lounge can be a full length bed too. The Chaise is I think the best part. I’d move the sink opposite the toilet for 6-10 more sq’ for more kitchen, whatever. I too rather be more open with the bed folding away or behind a curtain, etc. Though with 2 living you need some space to get away in. 2 doors are likely code requirement. Hey Alex – Like the design for the most part but would prefer open shelving in kitchen to overhead cabinet. As I have tons of books, would install a bookshelf with rail about 12″ below surface at least in bedroom, running around walls like a frieze. Problem I always have with these tiny designs, when thinking of myself, is that there is not enough room to exercise, which is a daily mandate for me. To that end, I would love to see a huge-surface table like object in the great room which could be wall-mounted to flap down out of the way, pulled out to seat multiple folks, and be height-adjustable to serve as a standing workstation for graphic design and also for cutting/sewing projects. Everything else looks good. And room for a convection washer/dryer, too! What software did you use to create the 3-D images? Is it open-source, or would you have recommendations for open-source software to design in 3-D? Thank you! With the exchange of the fixed furniture to more multi-use furniture, like a murphy bed that turns into a table, etc. The only change I’d make is to turn the washer/dryer unit around and make it part of the closet in the bedroom. Better yet, make it a dual function washer/dryer combo and use the space above it, near the bathroom, for a linen closet. I’m very interested in spaces that convert quickly from a living to working environment, and found one interesting design in “Radical Office Design” by Jeremy Myerson and Phillip Ross. Page 166 shows a kitchen sink/counter that converts to a conference table. Page 176 shows a sofa/living room area that slides away to become a small triangular office. Like Steff, I would like to know what 3D software Alex used for his layouts. I’ve been using Google Sketchup for building renderings and floorplans, but it is difficult to use for depicting furniture. Hi Alex, I agree with a lot of the others here about the placing of the dining table. Looking at the 3D it seems that without the barstool set-up – the one you haven’t done yet. 🙂 Save yourself some money and don’t. The floor space looks equal to where the table is in the plan, so move it across to be at the end of the kitchen. Use only a single stool, sideways on, at the end of the sink worktop if you really want one. Swap the chaise longue for a day bed and you could add a second armchair. I have a day bed instead of a sofa, its great for lounging and only needs a spare duvet for a guest. Moving the desk to the wall with the laughing face and covering the wall to the bedroom with shelving for books etc would be essential to me. The way you have planned the space, it looks to me like you have considered the necessary eating, washing, sleeping, work and then added what you most enjoy; so it seems you forgot to add quiet downtime space. Good overall though. nice layout….maybe reverse sink area to where stove, fridge area. an island sink would let you take out wall between kitchen and living room area to open it up more. losing the over head cabinets would not be that big of a deal….might could even add another 6′ pantry on outside wall side. it is a good plan, just prefer a open flow from kitchen to living room. Okay, I would do what has been suggested and do wrap around book cases in the living/office area — I would have both open shelves and cupboards — also, I would have a drop down desk unit where your desk is currently shown, you would then have room to store your monitor etc, behind the flipped up desk so your work area would be out of the way when company was there. I would also find or make a dinning table option that would fold up for when you do not need the dinning space — you could make one that would fold on itself to the size of a card table so you would still have table area for work projects. I would use a Murphy bed in the bedroom so that you could have an area where you could get away from each other to relax, read a book watch some tv, visit with friends and not disturb the person working, what ever and then just pull down your bed at night. I would not get rid of cupboards in the kitchen there is little enough storage as it is. Then you could have a triple S bathroom you know, s__t, shower and shave in one space that would fit in the space the bathtub is in just put a small sink in the corner there — many rv’s have that setup, especially older ones. Then you would be able to add a foot or two to the kitchen. The space where the one door is across from the kitchen is wasted space also, I would make that one window smaller (or non existing by putting a window in the door) and put book cases there as well and a small chair. Actually, I do not think I could live in a five hundred square foot box — seems to work better if more elongated as I live in 325 square feet know and it all works — I have a small living room, small bedroom, decent sized kitchen, fair sized bath with a full tub and shower and then a 2nd bedroom that has been made into a closet and dressing room — my office space is where the dining table used to be. I have two outside doors, one comes into the living area and the other comes into what use to be the 2nd bedroom. While I have a small closet in the bedroom I used a trick I saw and screwed a one by 2 board along one wall with a groove (I actually used a piece of molding) between the wall and the top edge of the board where clothes hanger hooks fit over to extend my closet space — it holds a lot of clothes — I am surprised it has not been pulled off the wall! LOL I use tv trays for eating and when I entertain I do so outside where I have a full size dining table etc. Fun project Alex — I have to start doing that myself. Great ideas!!! 🙂 You will make an awesome tiny!